China’s Defense Ministry on Wednesday confirmed that weapons designers recently conducted the first test of an ultra-high speed missile vehicle considered cutting edge military technology. In a two-sentence statement faxed to news agencies and state-run media in Beijing, the ministry confirmed the flight test of a new hypersonic glide vehicle. U.S. defense officials said the test of what the Pentagon is calling the WU-14 hypersonic glide vehicle took place Jan. 9 over China. The ministry confirmed the test after it was first reported by the Washington Free Beacon Jan. 13. "Our planned scientific research tests conducted in our territory are normal," the ministry said in the statement. "These tests are not targeted at any country and at any specific goals." 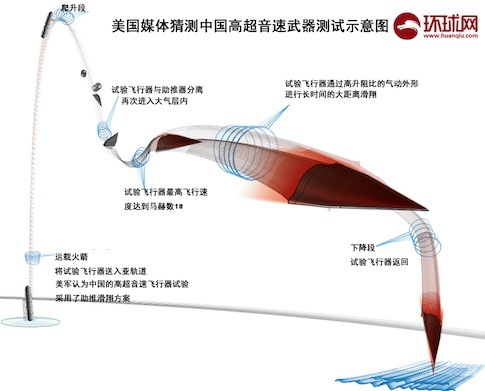 China military affairs analysts said the hypersonic vehicle test represents a major milestone in China’s military buildup of weapons it calls "assassin’s mace" arms—weaponry designed to allow a weaker power to defeat a stronger one. Officials familiar with some details of the hypersonic glide vehicle test said the high-speed glider appears designed to fit on top of an intercontinental ballistic missile. Using that booster, the vehicle is lofted to a height of 62 miles or less and then released. It then maneuvers at speeds as high as Mach 10, or 7,680 miles per hour, to its target. U.S. missile defenses are designed to counter hypersonic targets, namely ballistic missile warheads. What is different about the hypersonic vehicle is that its trajectory does not enter space, and that makes it more difficult to detect, track, and intercept with a missile defense interceptor. Pentagon spokesman Marine Corps Lt. Col. Jeffrey Pool confirmed the test last week. "We routinely monitor foreign defense activities and we are aware of this test," he said. Spokeswoman Marie Harf at the State Department had no immediate comment on the test. On Capitol Hill, the chairman of the House Armed Services Committee and two subcommittee chairman voiced concerns over what they said was a technological "leap" by the Chinese with the hypersonic vehicle test. "While round after round of defense cuts have knocked America’s technological advantage on its back, the Chinese and other competitor nations push towards military parity with the United States; in some cases, as in this one, they appear to be leaping ahead of us," Chairman Rep. Howard P. "Buck" McKeon (R., Calif.), Rep. Randy Forbes (R., Va.), and Rep. Mike Rogers (R., Ala.) said in a statement Jan. 14. Rick Fisher, a China military affairs expert, said the defense ministry confirmation was an unusual but positive sign. When disclosures appeared in the past in the U.S. press on Chinese missile tests, similar brief comments were made. "The implication is that the more U.S. officials say about Chinese military developments, the more it is possible to encourage China to itself become more transparent militarily," said Fisher, with the International Assessment and Strategy Center. "It appears that for too long U.S. officials have refused to disclose publicly what it is possible to reveal, even within limits needed to protect sources, because these officials feared offending their Chinese counterparts." "China's test of a hypersonic glide vehicle proves that American reticence about China's high-tech military developments diminishes American security by detracting from a needed political debate about real American defense requirements," Fisher said. "We are in effect disarming ourselves." Lora Saalman, a specialist on China’s military with the Carnegie Endowment, said the hypersonic test highlights a new trend in Chinese transparency. Chinese experts have in the past emphasized transparency of intent over capabilities, she said. "However, China has increasingly become a country of transparency through display of capabilities rather than intent," she said. "This has occurred in a range of areas from anti-satellite and ballistic missile defense tests to unveiling of stealth fighters and unmanned air vehicles." "This is China’s new form of transparency," Saalman said. "It suggests that China’s official statements, white papers, and posture declarations are lagging behind its military developments. This is why placing an emphasis on Chinese technical studies to supplement often staid official statements is crucial." The United States is developing two hypersonic vehicles, the unpowered HTV-2, or Hypersonic Technology Vehicle-2, and the X-51 Waverider, a scramjet powered high-speed vehicle. A report by the Air Force National Air and Space Intelligence Center stated recently that Russia is building "a new class of hypersonic vehicle" that would "allow Russian strategic missiles to penetrate missile defense systems." A former commander of Russia’s strategic nuclear forces in Moscow said China’s hypersonic vehicle test was a milestone but that Beijing trails both Russia and the United States in the development of the arms. "China has hardly surpassed the Americans and the Russians as it has just accomplished its first hypersonic missile test," former Strategic Rocket Forces commander Col. Gen. Viktor Yesin told Interfax-AVN. "History shows there are no miracles in the development of missile systems." Yesin, an adviser to Russian military leaders, commented prior to the Chinese Defense Ministry confirmation of the test and said that if the test were confirmed "then China has taken the path of the United States and Russia that started to design such missiles in the beginning of this century." Without access to the Chinese test results it is impossible to gauge the success of China’s hypersonic weapons program. "We should say at the same time that the United States and Russia have conducted a number of hypersonic missile tests but they have not achieved the successful separation of glide hypersonic warheads," he said. "The designers have run into numerous problems and most of them have not been resolved so far." Yesin said he expects the Chinese to encounter similar problems.